According to the Merriam-Webster online dictionary, a satrap is a governor of a province in ancient Persia. The etymology is Middle English, from Latin satrapes, from Greek satrapēs, from Old Persian khshathrapāvan; literally, protector of the dominion. 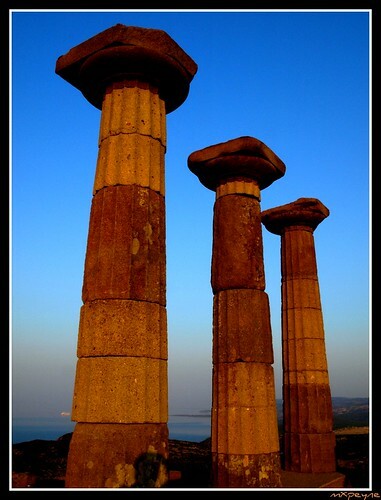 In Aristotle's time, a number of Greek colonies existed along the coast of Asia Minor (contemporary Turkey). Aristotle himself was for a time a guest of a satrap named Hermias of Atarneus, and established a school in the city of Assos. Aristotle married Hermias's niece (or daughter or ward or concubine, it's not known for sure), a woman named Pythias. After Aristotle had left Assos, Hermias was captured by the Persian forces, tortured, and crucified. His last words were supposedly to assure his friends that he had "done nothing unworthy of philosophy". After his death, Aristotle wrote a hymn to virtue in his honour.